American Legion Post 149 is looking for patriotic folks who want to show their support of veterans by marching or entering a float in the Parade honoring our veterans November 11 in downtown Jasper. If you have ever wanted to march down Main street or ride on your own float while being cheered by happy onlookers on the street corners and sides of the parade route…now is your chance to shine. There is no charge for entering the parade. The only request is when registering you give parade coordinators the name of float or marching group. Registration can be made online at alpost149@gmail.com. Questions should be directed to Steve Whitt at the same email address or the Legion hotline number 706- 253-1715. 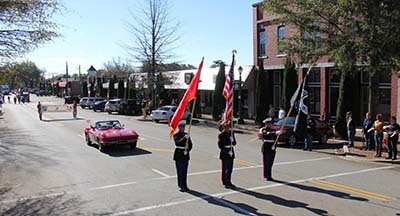 Parade participants will form up at 9:00 a.m. behind the Jasper United Methodist Church on Spring Street with the kick off time starting at 10. The route will go down Main and turn past the Court House onto Stegall where all of Jasper Elementary School Students and their teachers will be cheering as they hold up their patriotic posters. The route will end at Lee Newton Park for a special tribute to all of our veterans, past and present. 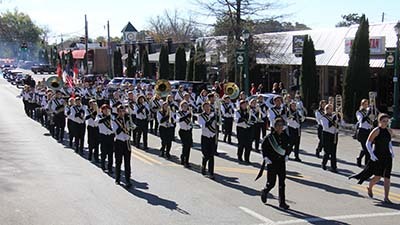 Special music sure to have everyone wanting to move their feet to the patriotic beat will be performed by Pickens High Marching band. The granddaughter of U.S. Army Veteran Ron Wheeler, Miss Andrea Layne will sing the National Anthem followed by the reading of names of all fallen veterans from Pickens. Veterans Day finale will feature a special patriotic message given by U.S. Army Major Donovan Duke. Major Duke, currently assigned as an assistant Professor of Military Science at the University of North Georgia, was deployed in support of Operation Desert Shield/Storm; four deployments to Operation Iraqi Freedom in Iraq and two deployments to Operation Enduring Freedom in Afghanistan. Enlisted at age 17 in 1989, Duke received his commission in 2005 upon graduation from Fort Benning Officer Candidate School. Highly decorated, some of MAJ Dukes awards include: Bronze Star w 3OLC; Purple Heart, Meritorious Service Medal w/2OLC, and Army Commendation Medal with Valor. Come show our veterans the support they deserve and take part in Jasper’s Veteran Day Celebrations. Bring your friends and wave your flag proudly as you walk down Main Street as part of the parade or just as a supporting fan. Let's make Veterans Day 2016 one to be remembered.